Make a wish! Who doesn't recall blowing on a puffy dandelion to send the delicate "seed parachutes" soaring on the breeze? Harken back to simpler times with this summer-inspired toilet seat decal. 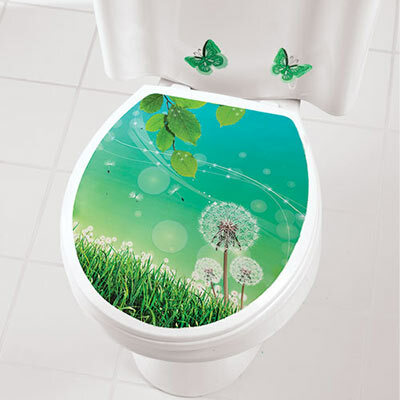 Toilet seat decal features a field of cottony dandelions and a branch of leaves with glitter accents. Easy to apply and to remove, electrostatic vinyl adheres to most smooth toilet seat lids; can be cut to fit most sizes. Two coordinating butterfly stickers included for accenting the tank. 12½" x 14¾". Hurry! Quantities are limited!